A leather luggage tag is nice but why hurt and animal just for a tag on your bag. 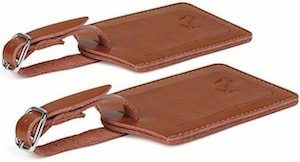 But no worries we found this luggage tag that looks like leather but is actually just printed like it so it looks amazing on your bag but the luggage tag is just plastic and last way longer then a leather one. On the front of the luggage tag you can see your name and stitching and on the back it holds all the info you would like on a bag tag. This personalize luggage tag is classy and perfect for a business traveler or anyone else that wants a great looking tag. If you don’t like this ugly business card size luggage tags and are looking for something more classy then you came to the right place. This luggage tag is smaller and much more special. Hand made specially for you this luggage tag is made from 8-9 oz heavy leather and dyed in a range of colors for you to choose from. 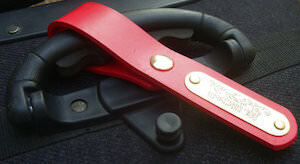 The luggage tag has a heavy snap close that is hard to open and that means hard to loose. And then on the leather strap there is a solid brass ID tag that will have your information stamped in it. Just imagine the look of this special tag on your bag or suitcase. If you use your passport a lot then you notice that it gets a lot of wear over time and that is why they invented passport covers that will protect your passport and just look a little bit nicer to. 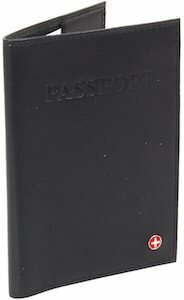 This passport cover made by Alpine Swiss is made from black lamb leather giving it the look and feel that an traveler needs and the embossed word “Passport” on the front makes it easy to find. And yes this passport cover will fit all standard passports so that you can rest a sure that your will fit and keeps looking like new. Luggage tags become fun again. This bag tag is not square but heart shape and it’s made from leather so it will look nice on your expensive bags to. 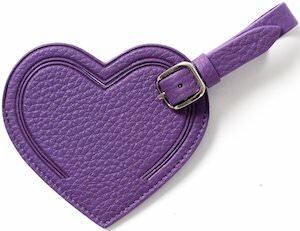 And besides the purple of the picture this heart shaped luggage tag comes in many colors and yes that includes red but also yellow, burgundy, blue, green and many more fun colors. And the id card is hidden behind a flap so it’s not visible like that to the whole world only to the people taking the time to remove the strap. We can always use a little bit of love and maybe this heart shaped bag tag can bring you some. 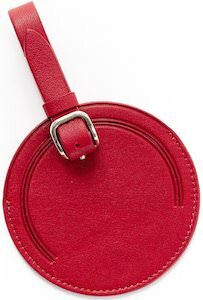 Why get a big ugly luggage tag when you can have a nice classy round one that is a nice red and made from leather. A bag tag like this is one you could leave on your hand luggage just in case something happens. And normally people can’t see the address information as it is hidden by a flap. On the inside you can write all the important information there need to be on a luggage tag. And with 3.35 inch high and wide this tag is just perfect for your luggage. No more cheap plastic tags for you luggage as they deserve a classy tag like this one.